The 50° Source 4 750 Watt White Ellipsoidal Spotlight Pigtail combines the energy-saving power of the patented HPL lamp, with a dichroic reflector and optical-quality lenses. Source 4 technology provides a clean white beam for unequaled imaging, crisp pattern projection, and a bright, even field. Rated for 375, 575 or 750 watts, the Source 4 is perfect for punching through saturated colors and providing the longest throws. The optional EDLT lens tubes for 19, 26, 36 and 50° field angle models make the Source Four even better for ultra-crisp, high-contrast gobo projections. When fitted with a 750 watt HPL bulb (available separately), this fixture will provide a beam of 349 footcandles 9.5 ft (2.9 m) in diameter, from a distance of 10 ft (3 m). It will throw 56 footcandles 23.8 ft (7.1 m) in diameter, from a distance of 75 ft (22.7 m). This model includes a Pigtail. For this fixture with a 3 prong Edison Power Plug, order #7060A10101A. For this fixture with a Stage Pin plug, order #7060A10101B. 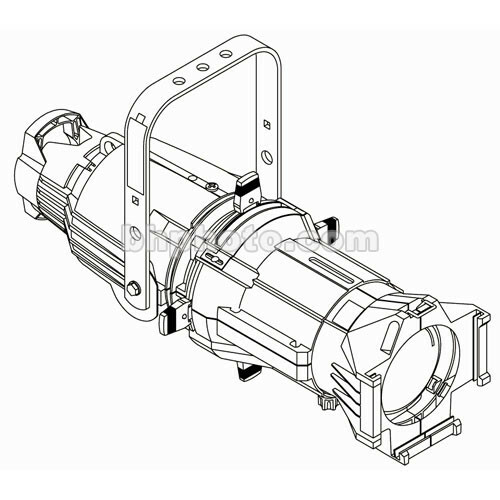 For this fixture with a 20 Amp NEMA Twist-Lock connector, order #7060A10101C. Thermally insulated rear handle, knobs and shutter handles, and heat-sink lamp socket make handling and aiming easier; gels, patterns and shutters last longer, and your performance space stays cooler. The white finish of the fixture and accessories calls less attention to itself when used in architectural applications. Die-cast aluminum construction, 20 gauge stainless steel focusing shutters in a 25° rotating assembly will provide many years of dependable service. The special HPL bulb and borosilicate reflector provide more lumens per watt: at 575 watts the Source Four literally outshines other brands' 1000W ellipsoidals. At 750 watts, no other ellipsoidal can compare to this fixture. The steel yoke has 2 mounting position choices. Fixture has 2 accessory slots, and a top-mounted gel frame retainer. Other focusing tubes are available. An optional iris is available. Tool-free lamp centering and peak/flat adjustment knobs are built in. Functions with 115-240 AC Voltage, with the appropriate optional bulb and power plug. The patented, optional Dimmer Doubler allows two lighting fixtures to operate independently using only one dimmer. Box Dimensions (LxWxH) 23.0 x 10.0 x 10.0"